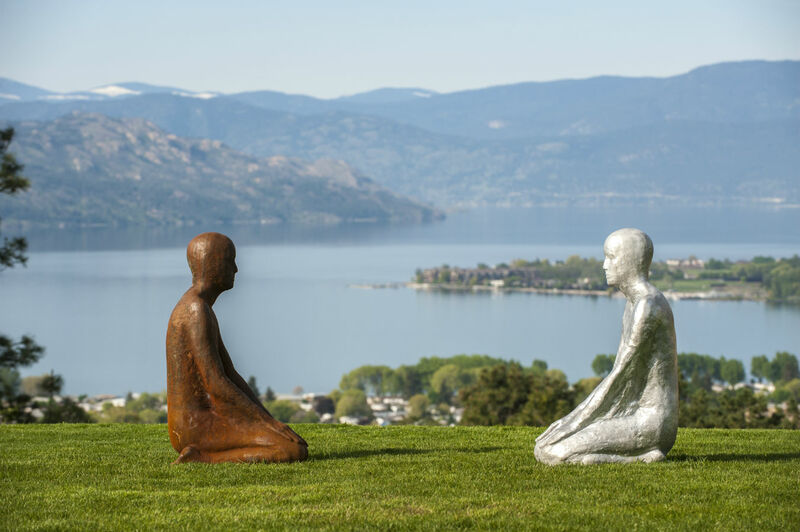 Twin sculptures by Steinunn Thórarinsdóttir, Flow 1 & 2 (one in Corten steel and the other aluminum), sit overlooking Lake Okanagan at Mission Hill Family Estate winery. Encounters with Iceland features the works of acclaimed Icelandic artist Steinunn Thórarinsdóttir at Mission Hill Family Estate winery. 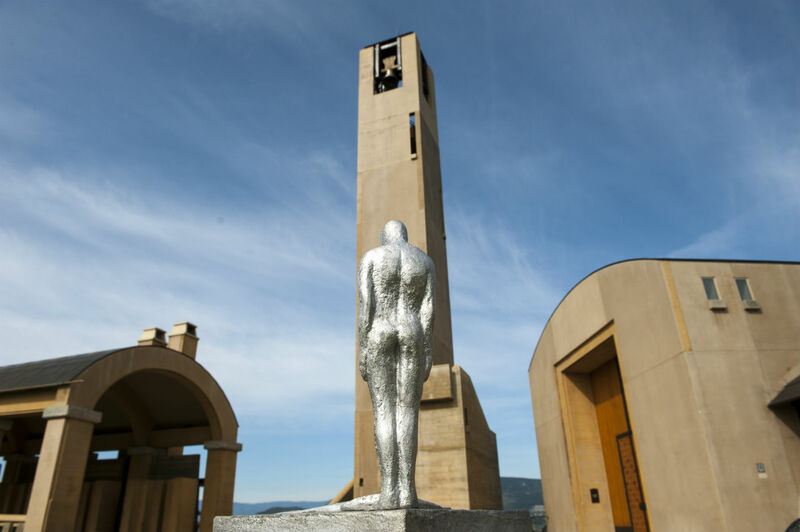 The Encounter sculpture by Steinunn Thórarinsdóttir stands atop a base of Icelandic granite located under Mission Hill Family Estate winery’s bell tower. 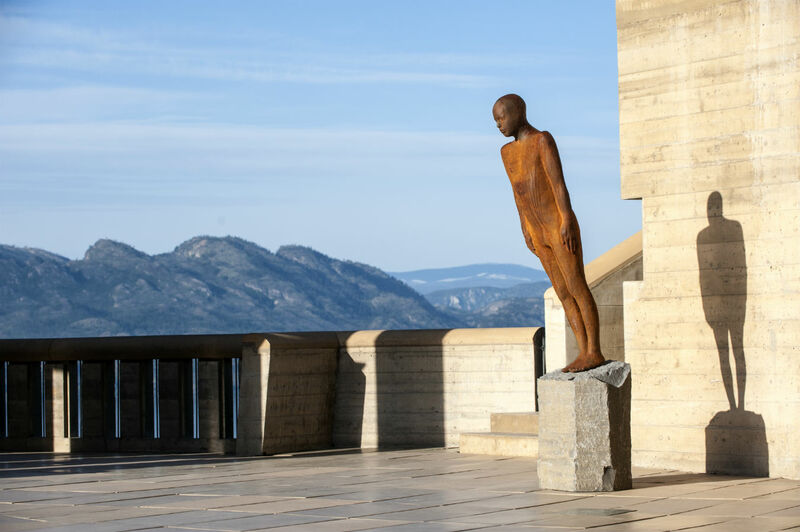 Place by Steinunn Thórarinsdóttir, located in the main courtyard at Mission Hill Family Estate winery. Steinunn Thórarinsdóttir at Mission Hill Family Estate. Not unlike a case of fine vintage vino, it’s a rare case that wine country, in any country, doesn’t get better with age. When growing conditions are prime, rows of tangled grapevines anchor a winery’s horizon with a slow-growing sense of patience and place. At Mission Hill Family Estate winery in British Columbia’s Okanagan Valley, this recess from the ordinary reaches a near-monastic realm. Situated high above Okanagan Lake and sequestered behind 4,500-kilogram steel gates, Mission Hill welcomes almost 130,000 visitors annually, with good reason, as proprietor Anthony von Mandl built the property up around a foundation of, yes, award-winning wines, but also much more. “The idea at Mission Hill was always to celebrate the art of fine wine and the culinary arts, the performing arts, and the visual arts. And the space, from the very beginning, was designed to contain sculpture.” To that end, the winery’s latest installation Encounters with Iceland alights upon the property this summer, opening to the public on June 22. 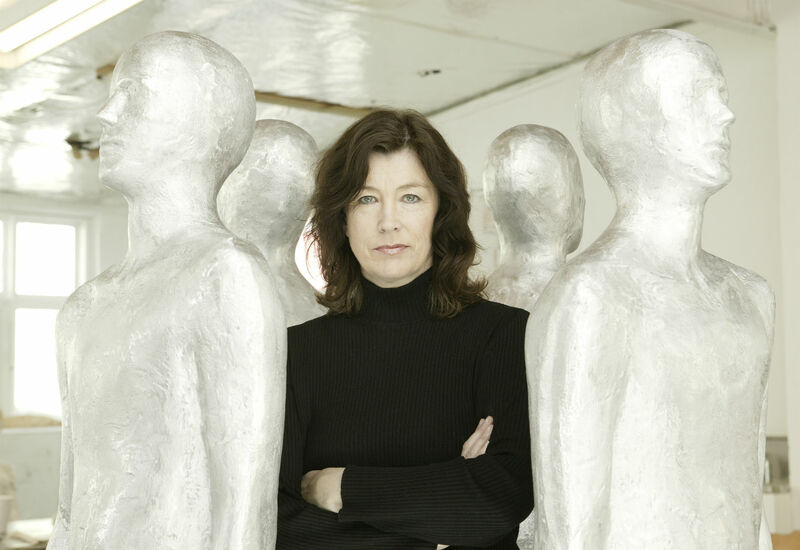 The creative mind of Reykjavik-born artist Steinunn Thórarinsdóttir is behind the 40-plus sculptures now dotting the grounds, who von Mandl first met while on a trip to Iceland last year: “[My wife and I] look all over the world for art, and every couple of years we stumble across something that really emotionally resonates.” And so, the artist’s pieces have traversed the globe over the course of two months and made their way to Canada.